Buy of 12 VOLT REGULATOR WITH LOW VOLTAGE DISCONNECT. 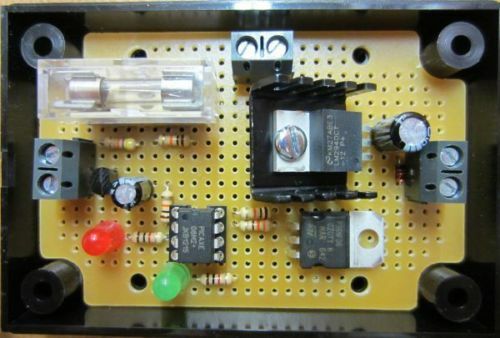 This device is a combination of our LED light protecting 12V Regulator with Fuse and Switch Terminals and a battery protecting low voltage disconnect (LVD). The battery connects to the input side and on the circuit board passes through a 1 Amp fuse and terminals to which you can connect your own ON/OFF switch. 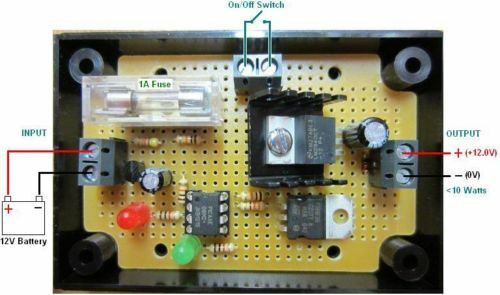 When the switch is in the ON position (or if the switch terminals are simply shorted with a piece of wire if you do not want/need to use a switch) the low voltage disconnect circuit is powered. If the voltage supplied is measured to be above 11.9 Volts then a regulated output (rated for up to 10 Watts total of lighting) comes out of the output side supplying the lights with power at a safe voltage. If the input voltage then falls below and stays below the 11.9V threshold continuously for 10 seconds, the regulated output is automatically turned off – i.e. the low voltage disconnect is engaged protecting the battery from getting overly discharged. Subsequently, when the battery voltage is measured to be over 12.5V continuously for 10 seconds, the output turns back on again. This circuit draws less than 1.0mA of current when the low voltage disconnect is engaged and so it will not deplete the 12V battery it is connected to.